Be the change that you want to see! Tahmina Mitra Ashraf loves traveling, dancing and inspiring. Of course, she has ambitions for humanity as well. Her main interests are human rights and the rule of law. She holds a masters’ degree in Public International Law and specialized in girls’ right to education, with a special focus on Pakistan, Taliban and the Shari’a. Tahmina is also a board member and initiator of the educational and cultural peace foundation, Voice of Afghan Wo(men). Their main goal is to protect human rights of minorities by means of non-formal educational tools. 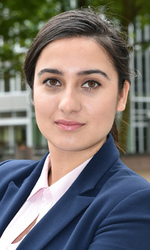 Tahmina works currently as policy officer at the Province of South-Holland. She is, however, looking forward to take a next career step toward the human rights field and protect the right to education. She also aims to inspire and show the world that the future of refugee girls can be awesome, by being awesome!